Increase student engagement and understanding with this poetry analysis unit. 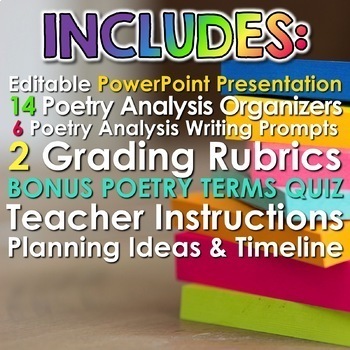 This unit includes a multi-day, editable PowerPoint presentation filled with direct instruction and step-by-step poetry analysis, a sample poem to analyze with your students, and materials and writing assignments to use with any poem! Your students will love these interactive and hands-on close reading organizers and scaffolded writing responses. 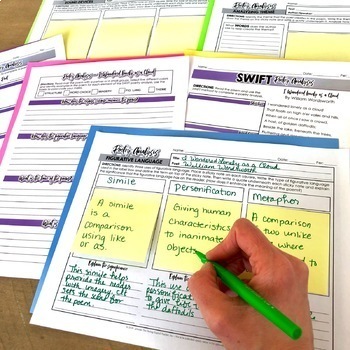 Students will enjoy using sticky notes in class as they analyze complex speeches and nonfiction texts. 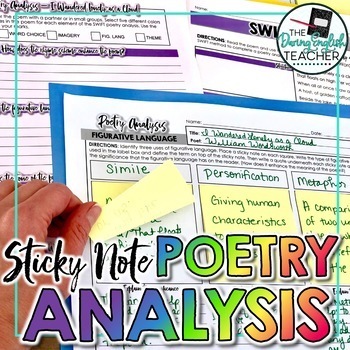 This sticky note poetry analysis unit is a great way to help students learn to thoroughly analyze text. *This unit was designed to be used in a high school classroom. Also, since the direct instruction PowerPoint is editable and there are a variety of organizers, this unit is also suitable to use in the middle school classroom with minimal modification. 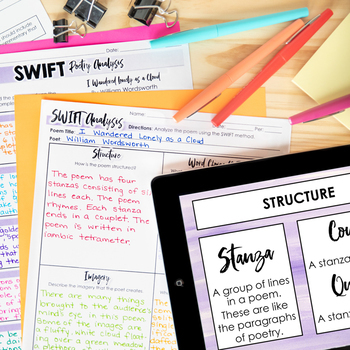 This unit includes almost all of the resources you will need for a complete poetry analysis unit. You will need to choose and provide additional text you read in class to make your own unit come to life. With a little prep work and all of the materials in this unit, you will teach the best poetry analysis unit ever! The included PDF pages are secured and not editable.